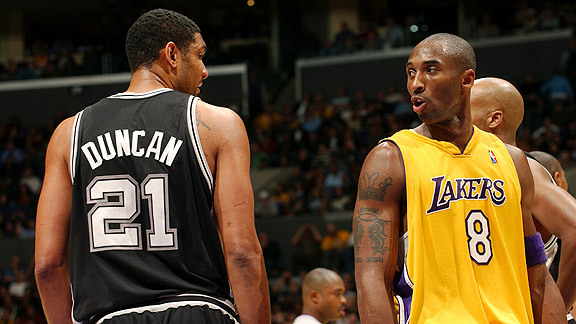 Andrew D. Bernstein/NBAE via Getty Images Tim Duncan and Kobe Bryant spent the decade vying for supremacy with their respective teams. Visitors to our page have had the invitation for a month to vote for the standout players, teams and memories from an NBA decade that dribbles to a halt in just two weeks. With the results of SportsNation polling scheduled to be revealed in installments starting with Friday night's episode of KIA "NBA Shootaround" on ESPN at 7:30 p.m. ET, we've weighed in by addressing all 10 topics introduced at the link above on a ballot of our own. Consider the following questions and answers an All-Decade appetizer, with more reflections and rankings from the past 10 years forthcoming from ESPN.com's NBA team in the final days of 2009. 1. Which is the franchise of the decade? but we're doing it anyway. Beyond the three Tim Duncan-led championships (2003, 2005 and 2007) that stand as the league's loudest counter to any conspiracy theorist, or its 10-for-10 run of 50-win seasons, San Antonio is the franchise so many other franchises want to emulate philosophically. You'll note that four Gregg Popovich/R.C. Buford disciples (Cleveland's Danny Ferry, Phoenix's Steve Kerr, Oklahoma City's Sam Presti and Portland's Kevin Pritchard) are running front offices in other cities. And that three of the decade's younger coach of the year winners (Orlando's Doc Rivers in 2000, Dallas' Avery Johnson in 2006 and Cleveland's Mike Brown in 2009) were also Pop-trained. A small-market team's keeping pace with the Lakers, without the blessing of a Pau Gasol donation, is a trick that can't be ignored. 2. Which is the team of the decade? The truth is that there isn't a roster among the five teams listed that could claim to have a ceiling to match the potential of the current Lakers. But the star fivesome of Kobe Bryant, Gasol, Lamar Odom, Ron Artest and Andrew Bynum belong to the next decade. Although the 67-win Lakers of 1999-2000 had an absolute bounty of trusty role players in support of Bryant and Shaquille O'Neal -- Glen Rice, Ron Harper, Robert Horry, Brian Shaw, Rick Fox, Derek Fisher and A.C. Green -- we're going with the 2000-01 team that didn't have Rice, swapped Green for Horace Grant and won only 56 games. Because of what it did in the playoffs. Infuriating as those Lakers could be after that first championship as they seemed determined to snooze through the regular season until they absolutely had to flip the switch, L.A. wound up sweeping through the first three rounds of the 2001 playoffs and amassed the most impressive postseason record (15-1) in league history. Only Allen Iverson's 48 points and a Game 1 loss to Philadelphia, after a 4-0 brooming of the Spurs in the Western Conference finals, prevented those Lakers from going unbeaten. 3. Who is the player of the decade? The 1990s were obviously owned by Michael Jordan. The 1980s were co-owned by Larry Bird and Magic Johnson. Kareem Abdul-Jabbar was the most feared force in the 1970s, Bill Russell and Wilt Chamberlain bossed the 1960s and George Mikan and Bob Cousy are synonymous with the 1950s. If only the 2000s broke down so neatly. You can't even get to the likes of LeBron or KG because of the thickly layered debate generated by this most complicated of triangles: Shaq, Duncan and Kobe. but the next team he leaves on good terms will be the first. Duncan can match Shaq's four championship rings and won them down in unfashionable south Texas with three different supporting casts -- as well as the sweetest bank shot in the modern game -- but treasures his privacy as much as those rings and thus might never be fully appreciated for the sort of champion and teammate he is. As for Bryant, well, No. 8-turned-No. 24 is only the most polarizing figure in NBA history, concurrently beloved and loathed worldwide. You get dizzy just thinking about the various highs and lows on the Kobe Coaster over these past 10 years, from his 81-point game and last spring's championship breakthrough sans Shaq to the dark days of Colorado and a forever tense coexistence with O'Neal that remains somewhat of a Hollywood soap opera to this day. No one has ever shouldered the Next Jordan burden like Bryant, who would suddenly appear to have a decent shot at surpassing MJ's six titles in Chicago with the crew he's got in Lakerland now. He's been the consensus top talent in the league for years and is widely considered its hardest worker. List all the negatives you want to satiate the haters, but the NBA player you're most likely to remember when someone asks about the first decade of the new millennium is not O'Neal or Duncan. Close as this call is, Kobe Bean Bryant has to be the choice. Has to be. 4. Which is the shot of the decade? An easy one at last. Unforgettable as Fisher's swish was -- there are folks who still call him Point Four to this day -- only one of the four shots nominated helped a team win it all. Of all the playoff moments that moved us to anoint him the greatest role player of all time in this column during the 2005 Finals, Big Shot Rob's signature moment is surely the dagger he launched from the middle of the floor at the Game 4 buzzer of the Western Conference finals. If he misses, Sacramento claims a two-point victory and takes a 3-1 series lead back home for Game 5. Horry's dagger and follow-up sneer instead capped a rally from an astonishing 24 points down and primed the Lakers to pull the series out in seven games -- albeit with the help of infamously dubious officiating. 5. Which is the playoff game of the decade? How do you top a Game 7 that goes to OT? and goes to the road team? I would argue that Phoenix and San Antonio did just that in Game 1 of the first round in the 2008 playoffs. The Lakers manufactured amazing late resurrections in both of the first two games offered up in this category. Chicago's forcing a Game 7 against Boston just last spring certainly wasn't bad, either. and this was as good as it got. The Spurs ultimately claimed a 117-115 victory in double OT and Phoenix never recovered, losing that series in five games, seeing Mike D'Antoni abruptly resign days later to coach the New York Knicks and falling all the way out of the playoffs last season in the wake of D'Antoni's departure. Which is why, as they used to say in Basketball Digest, it's a game I'll never forget. 6. Which is the NBA Finals performance of the decade? Shaq absolutely pulverized the Pacers and Nets in 2000 and 2001. Dwyane Wade's relentless will -- and frequent trips to the free throw line -- inflicted psychological wounds in Dallas that took years to heal. Neither, though, can top what Duncan did to the Nets in 2003. Take another look at those numbers: 24.2 points, 17.0 boards, 5.3 blocks and 5.3 assists. There were loud calls in 2005 claiming that Duncan's NBA Finals trophy should have gone instead to Spurs teammate Manu Ginobili, but 2003 was Duncan at his most dominant. San Antonio's clinching triumph in Game 6 was David Robinson's farewell game and featured a fitting signoff of 13 points and 17 boards from The Admiral. Yet it was still Duncan's day with a ridiculous 21 points, 20 boards, 10 assists and eight blocks to finally turn the Nets away in a series that was probably closer than you remember. 7. Which is the nickname of the decade? With apologies to this quartet of nominees, I'm taking the liberty of going off the board, whether I'm allowed to or not. I'm not voting for any of the above because "Two Time" is my runaway fave. That's what they call Steve Nash in Phoenix, if you didn't know, in honor of his back-to-back MVP awards in 2005 and 2006, which he snagged as the quarterback whose contentious departure from Dallas in the summer of 2004 almost instantly established the Suns as the NBA's best entertainers of the decade and an annual threat to win 60 games. If you don't like the choice, well, too bad. I ain't thrilled that Nash, with those two MVPs, somehow didn't make the list of Player of the Decade nominees. 8. Which is the performance of the decade? I'm breaking my own team-success-trumps-everything rule on this one because the quality of the opposition, where the Lakers were in the championship pecking order at the time and any other factor you might suggest to dismiss this feat are all pretty much nullified when we're talking about someone's scoring 81 points in a single game. We believed it at the time and still do: Kobe's hauling his team from 18 points down by uncorking 51 of his 81 points after the Lakers trailed 73-55 in a January game against Toronto is a more impressive feat than even Wilt Chamberlain's 100-point game in 1962. The previous link and this one from Professor Hollinger contain all the reasons why. 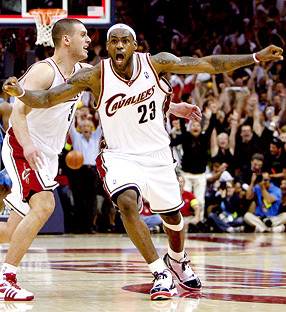 What LeBron did to the Pistons in the 2007 East finals -- absolutely dismantling 2004's proud champions by scoring 29 of his team's final 30 points -- certainly had more meaning given the playoff stage and undoubtedly ranks as James' signature game as a pro. Yet it can't top the most outstanding individual performance ever witnessed. Which is what Bryant delivered. 9. Which is the NBA Finals of the decade? Miami and Dallas didn't go seven games in 2006, but that's basically the only thing that didn't happen in the wildest Finals of the decade. You had two teams new to the game's biggest stage hooking up in a matchup that ultimately delivered just the third comeback from a 2-0 deficit in Finals history. Which was almost a 3-0 deficit for the Heat, who were trailing by 13 points at home in Game with just 6:34 to go before Wade suddenly zoomed to a level few have matched when it matters most. There will always be whispers about Miami's resurrection because of the aforementioned 97 free throws awarded to Wade in the series, including a whopping 25 in the Game 5 comeback that put the crumbling Mavs on the brink. But that doesn't change just how good Wade was in those last four games, carrying both Pat Riley (fifth title as a coach) and Shaq (fourth ring) to new heights by finishing the series with these heady averages: 34.7 points, 7.8 boards and 3.8 assists. and Riley's equally criticized return to the bench in December to replace Stan Van Gundy. No one, least of all me, can deny Miami this perch now. San Antonio and Detroit did go to a seventh game in 2005, but not even that series -- or the long-awaited Celtics/Lakers Finals reunion in 2008 that redefined the careers of Garnett and Paul Pierce -- could match the drama that Miami and Dallas delivered with their respective recovery and collapse. 10. Which is the playoff series of the decade? I personally covered all of the above aside from Boston-Chicago and could easily nominate either series involving the Lakers as the decade's standout, since both of those matchups were regarded as that season's true championship series. The Blazers or the Kings would have been heavily favored in the Finals had they managed to finish off L.A.
Suns-Spurs in 2007 was an all-timer of the highest quality, too, which unforgettably swung on Horry's body check on Nash late in Game 4 and the subsequent Game 5 suspensions for Amare Stoudemire and Boris Diaw for leaving the bench. If you went with Kings-Lakers in 2002, I totally understand. That's the series folks still talk about today, although the highly questionable nature of the fourth quarter in Game 6 -- with the Lakers shooting 27 free throws to Sacramento's nine -- and convicted referee Tim Donaghy's determination to keep the memory of that game in the news is always bound to overshadow how good the other six games were. Especially Game 7. But I'm closing with a personal favorite, probably because I can still hear the ever-classy Duncan -- in defeat -- calling it the best series he's ever played in. The Mavs jumped to a 3-1 lead against the intrastate rivals who had bullied them for years. San Antonio answered with two wins to force a deciding Game 7 back home. Then Dallas, after squandering a 20-point lead in that Game 7, took control of the series for the third and last time and ultimately prevailed in OT on mighty San Antonio's floor, set up by a clutch drive and free throw from European player of the decade Dirk Nowitzki -- and an unfortunate assist from Manu Ginobili -- with the Mavs down by three at the end of regulation. Q: I don't want to be insensitive about it but after what you just went through health-wise does that almost make it easier to play the game? I'm guessing you had bigger things on your mind than basketball when you were out. A: Definitely the pressure's off after so many tests, making sure that everything was fine, waiting and watching the guys out there playing. When we got the results back it was a big lift off me just to know that everything was negative. [Then] it was just up to me to work my way back into the lineup and get back to playing the way I was playing before all this happened. Q: How scary was the whole thing? A: It was very scary just to go through that, because you really don't know what was wrong. [I had a] loss of feeling in my right arm for a little while [before a Nov. 15 game at Detroit], but it eventually came back. That's a big scare. That's almost like being paralyzed for 15, 20 minutes. But all the feeling came back. Everything worked out fine. All the tests came back negative and it was just a happy feeling to know that everything's OK. Just knowing that everything's all right lifts a lot of pressure off me. Q: Dirk [Nowitzki] always says this team is a different animal when you play well. Can you keep this going? even if it's just getting [other] guys open. Q: You've been here six years and you're in the final guaranteed year of your contract. What kind of future do you think you have in Dallas? A: At the end of the season, it's my option to do whatever I want to do, whether I want to keep playing or retire. But I'm not even worried about that at this point. I think the most important thing for us is that we've got a chance to win a championship. We've got all the pieces here. Q: Championship [contention] is realistic? A: We're a good team. We can play with anybody in this league. "My WBA team was also called the Hornets when I was little." Hornets guard Chris Paul, informing your Weekend Dime correspondent -- and the rest of his nearly 80,000 followers on Twitter -- that the Hornets were his team of choice as a youngster in Winston-Salem, N.C., when the franchise was still playing out of Charlotte. Maybe you've already read somewhere that Paul was a Hornets fan as a kid. But I honestly hadn't heard or seen much about it until he started talking on Twitter last weekend about his Hornets Starter jacket as a kid. Given all the fretting already about how much longer New Orleans can hang onto Paul and how many times I've blasted Atlanta for not taking Paul with the No. 2 overall pick in the 2005 draft -- especially after Paul made it clear he was hoping the Hawks would draft him, which hasn't exactly happened often in Hawks history -- I felt compelled to devote some cyberspace to Paul's longstanding fondness for the Hornets. Even if it's something some of you serious Hornets fans out there were already aware of. Golden State's Anthony Randolph is indeed available via trade, as numerous reports suggested this week, but NBA front-office sources indicate that the Warriors are trying much harder to move Corey Maggette. The sure way to snag Randolph, then, would be taking Maggette in the same deal. That's clearly the Warriors' hope. The issue there, though, is that Maggette has three years left on his contract after this season at $30.8 million, courtesy of one of Chris Mullin's last acts as Warriors GM. A team would have to really like Randolph and believe it can finally reach him to take on Maggette as well, especially in this economy. Obviously no one is untouchable on a 7-18 team, but sources with knowledge of the Warriors' thinking say that their willingness to move guards Monta Ellis, Stephen Curry and Anthony Morrow has been overstated. None of them are being "shopped," sources said Friday, although it seems safe to suggest that the Warriors would eventually have to part with at least one of them to land the bruising power forward -- such as Carlos Boozer or David West -- they lack and covet. 78: Pau Gasol's 22 rebounds Wednesday night in Milwaukee gave him 78 in the Lakers' past four games. It's the highest four-game total from any Laker since Kareem Abdul-Jabbar snagged 83 boards in four straight games during the 1975-76 season. With 26 points in the same game, Gasol also became the first Laker to total at least 25 points and 20 boards since Shaquille O'Neal on March 21, 2004 ... which was also a one-point overtime win over the Bucks on a game-winning bucket by Kobe Bryant. 25: The Clippers recorded their second road victory this season by a margin of at least 25 points in Wednesday's 120-95 rout in Minnesota. The Clips had only five 25-point road wins in the previous 39 seasons of the franchise's history, going all the way back to the eight-season run of my beloved Buffalo Braves. 22: Our man Omri Casspi had 22 points in his first start for Sacramento, helping the Kings escape Wednesday night with a 112-109 victory over Washington in the ESPN late game. Only one other Kings rookie besides the NBA's first Israeli has scored that many points in his maiden pro start since the team moved to California in 1985: Randy Brown did so with 22 points against the Clippers in 1992. 2: This is actually the second time in the career of Denver's Carmelo Anthony that he has averaged 30 points per game through 25 games. He did so in the 2006-07 season as well; Melo and former teammate Allen Iverson (1999-2000 and 2005-06) are the only active players to do it twice. and the first time Kobe reached that plateau at the United Center. Bryant has thrown down 40-point games in 23 different buildings, tying him for the franchise record with Lakers legend Elgin Baylor. Bryant also had a 20-point first quarter against the Bulls, giving him 29 20-point quarters this decade. Next in line since Jan. 1, 2000: Houston's Tracy McGrady with 11. One of the most prominent members of the Mavericks' front-office team has been targeted by the NBA to help run its soon-to-open offices in Africa. Dallas director of scouting Amadou Fall -- who had a key role in the drafting of prized Mavs rookie guard Rodrigue Beaubois and ranks as one of the league's foremost experts on African basketball along with Toronto's Masai Ujiri -- has been offered the opportunity to launch the league's new operations in the South African capital of Johannesburg. The Mavericks declined comment Friday, but league sources say that the NBA is determined to land the Senegal native, who has already served as a lead ambassador for the league on numerous "Basketball Without Borders" community outreach trips to the region. 5. Time For Heat Check? Pretty much only Heat president Pat Riley would dare to publicly question Dwyane Wade's efficiency and conditioning -- even politely -- with free agency mere months away for Wade. The numbers, though, would appear to support the contention of Riley and especially coach Erik Spoelstra, whose theory is that any dip from Wade's usual standards is tied mostly to his uncharacteristic struggles on midrange jumpers. You could certainly argue with ample conviction that it's just as likely Wade is simply wearing down from the absence of a dependable point guard at his side in Miami and the well-chronicled lack of bankable help in his supporting cast. Everyone knows Riley has put any significant signing and trading on hold until next summer, when Wade becomes a free agent and Miami hopes to use its copious salary-cap space to re-sign Wade and lure LeBron James away from Cleveland to join him. The problem there is that the Heat still have two-thirds of a season to slog through, with Wade counting heavily on slow-developing youngsters Michael Beasley and Mario Chalmers and injury-tortured vet Jermaine O'Neal to stop defenses from loading up on him. So you could also understand if Wade at times struggles to manufacture the zeal to push himself even harder than he normally does, knowing that the Heat, in their current state, would have to consider themselves extremely fortunate to win one round in the playoffs next spring. This is essentially a franchise on hold until July, albeit with a franchise player too good to let the Heat fall out of the top eight in the East. Yet you can't resist taking a deeper look at the facts and figures after what Riley said, even after he tried in this week's state-of-the-organization sit-down with local reporters to downplay the criticism by suggesting that Wade was bound to view it as "nitpicking." 8. Shot Of The Decade? Much of the buildup to the Bobcats-Knicks hookup in Charlotte earlier this week focused on New York's longstanding interest in second-year Bobs guard D.J. Augustin. NBA front-office sources say that the Knicks have continued to register interest in Augustin, but talks have not progressed to anything serious even though the second-year guard has fallen out of favor with coach Larry Brown. One reason they haven't progressed: Bobcats president Michael Jordan is apparently not ready to give up on Augustin, whom Brown pushed for over fast-blossoming New Jersey big man Brook Lopez in the 2008 NBA draft. Another reason: Even if the Knicks were willing to part with Al Harrington and his $10 million expiring salary in an Augustin deal, it's believed that Charlotte would want to package Boris Diaw with Augustin to get to Harrington's salary range. And Diaw is almost certainly someone Walsh wouldn't take on -- despite Diaw's history with Knicks coach Mike D'Antoni in Phoenix -- because the Frenchman has two years left on his contract after this season worth $18 million. The Knicks, as you've probably heard us say a few zillion times, aren't touching any contract that extends beyond this season to preserve maximum salary-cap space for the summer of 2010. Bobcats GM Rod Higgins, meanwhile, insisted in a recent visit with ESPN.com that there had been no discussions with the Knicks about Harrington and that rumblings to the contrary were likely inspired by Harrington's close relationship with new Bobcats swingman Stephen Jackson. 71: LeBron James rumbled for 36 points, six rebounds and seven assists in Wednesday's win at Philadelphia, giving him 71 games with at least 35 points, five rebounds and five assists since James' rookie season (2003-04). Next on the list in the same span is Kobe Bryant with 57 such games. 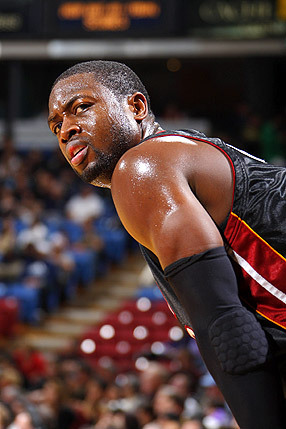 Houston's Tracy McGrady and Miami's Dwyane Wade are tied for third with 30. 9.1: Orlando's Dwight Howard is averaging just 9.1 field goal attempts per game this season after a career-best 12.4 FGAs per game last season. The flip side: Earlier this week, Howard recorded the 26th 20-point, 20-rebound game of his career. Since Howard's rookie season in 2004-05, Boston's Kevin Garnett second behind Howard with eight 20/20 games. 4: Charlotte's 15-2 spurt to end the game and topple New York at home Tuesday night marked just the fourth time in the Bobcats' six seasons of existence that they won a game in which they trailed by at least six points in the final three minutes of regulation or any overtime period. 3: Gilbert Arenas had 22 points, 10 rebounds and 11 assists in the Wizards' 114-113 home loss to the Pacers last weekend. It was the third triple-double by an NBA player this season, following LeBron's on Oct. 28 and the New Jersey Nets' Rafer Alston's on Nov. 13. But all three of those players were on the losing side; teams were 25-5 last season when one of its players posted a triple-double. and only two other players in all that time went for 16 points on 7-for-9 shooting with five boards and three swats: Cavs swingman Jamario Moon in April 2008 (with Toronto), and Portland's Greg Oden earlier this season.